Would using a cast iron grill pan work better for indoor grilling than using an electric grill? I'm mostly just interested in draining off the fat and getting good flavor. Grill marks aren't that important. I'm more interested in how food tastes than how it looks. I was thinking of buying this grill pan - Emerilware™ Cast Iron Grill Pan, 10" - Grill Pans Cookware - Kitchen - Macy's but I'm unsure. It's 10" but I get the impression that it will be too big for my electric burner. Although, I would like to be able to cook three to six burgers at one time. The other thing is that I'm unsure of how to reseason a cast iron grill pan. I know what to do the first time. But I don't know how often and when I should reseason it. I would be extremely grateful for any advice. First of all, you should be able to get a Lodge CI grill pan for about $10 less at a hardware store or a Wal-Mart. Second, you must have a very good ventilation system as this pan will produce a lot of smoke. It should fit your burner OK.
Seasoning is a continuous process. Once you season it, your cooking just adds to the seasoning. If you have to reseason, it's just the same process. I think you would have better results with a CI skillet than a grill pan. I love my grill pan. I don't think the electric grill machines get as hot as you can get a grill pan on the stove. I agree with Andy, get a CI one from Walmart, Kmart or any good local hardware store. If you have a TruValue or a TSC check out their camping gear, usually have some good heavy ones there. Mine is a SS tri-ply pan with non-stick coating. Was a great accidental find, it is as heavy as the CI but was 1/2 the price onsale. It makes GREAT burgers!!!! I have a gift card for Macy's that I need to use soon, before it expires. That's why I was looking at the pans at Macy's. Do you think the pan would smoke more than cooking fries in a baby fryer? On a scale of 1-10 with 10 being the most, how much would the pan smoke? Thanks to both of you for your input, I appreciate it. other liquids drip down on the bottom of the pan. The cast iron really holds the heat so when you put your cold food in the pan it cools down less than other pans. My son got one of those pans and I right now since he is home from school I am using it. It works fine. Just make sure that you dry it completely after you wash it. I put all my cast iron pans back on the stove to dry. Wash, wipe them dry and heat on the stove until completely dry. Only takes a minute. I use a CI all the time. If I have something like burgers I use a baster to remove the grease to a coffee cup. I like the grill marks it leaves on the meat. I usually grill veggies on mine as I like the grill marks! 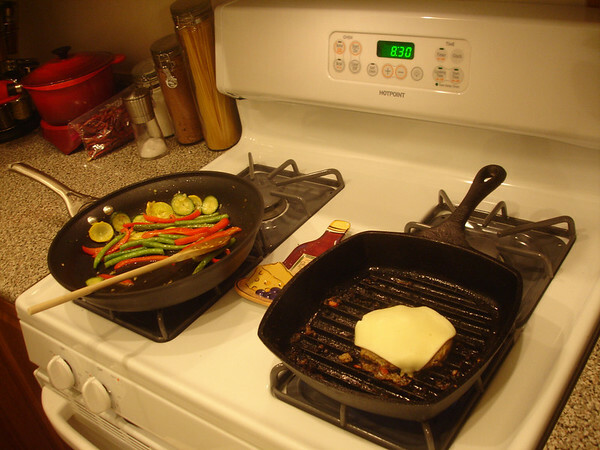 a cast iron grill pan is great...add a cast iron bacon press and you have a panini pan for lots less money than a specified set. Ventilation a must. THe benefit of the electric appliance would be less smoke and heat from both top and bottom at the same time (which you can approximate with the bacon press if you preheat it. I have that same pan and for say....grilling a steak, yeah...it smokes.....but if you have a fan above the stove, you'll be just fine. here is a picture of a burger in it. Looks like the ribs in the pan are thicker than the Lodge, which is a good thing. I have the Lodge and it blows. Used it once, then a second time just to make sure I didn't like it. Sits in the bottom of my cabinet now. Smoke will depend on heat and fat content. I use a med-high heat and usually don't have a smoke problem. I would suggest getting a splatter screeen though. It saves a lot of grease clean-up.